TERRANOVA Vitamin B-Complex with Vitamin C is enhanced with highly active, whole and unadulterated superfoods and botanicals. It provides the body with the most important nutrients for maintaining health of the nervous system, hair, skin and nails. Siberian Ginseng may help support adrenal and nerve health. One of nature`s most nutritious plants, alfalfa provides B-vitamins (and magnesium, which facilitates their utilisation) and other nutrients that may help maintain nerve health. 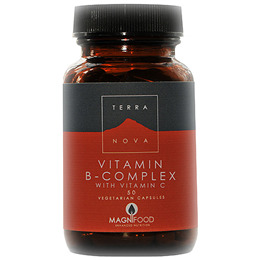 Below are reviews of TERRANOVA Vitamin B-Complex with Vitamin C - 50 Vegicaps by bodykind customers. If you have tried this product we'd love to hear what you think so please leave a review.